The key is to skip the inverter and power directly from 12-volt batteries. IF YOU ARE PLANNING TO LIVE OFF GRID, or are building something in a remote area without grid power, I am sure you are planning to use a generator. While I have also owned generators, I find them temperamental, noisy, and I hate to drag fuel up some mountain trail when I need to power construction tools. To wean myself off the traditional construction site generator, I found an amazing selection of high-quality power tools that operate on battery packs. In addition, if you standardize on the same brand and voltage, the same battery packs will be interchangeable with a wide array of power saws, drills, portable lights, and even radios. Keeping a spare battery pack on charge also allows a quick battery change and continued tool operation without having to wait. When I first started buying battery-powered tools, I decided to standardize on DeWALT, but there are several other good brands of battery tools that offer the same interchangeability of battery packs in multiple tools. It is amazing what you can build with just a few battery-powered tools, and a complete set is indispensable if you live off-grid or are building a remote retreat. Most manufacturers of commercial-grade battery-powered tools with Nickel-Cadmium (NiCad) battery packs have increased their voltage from 12 volts up to 18 volts to increase tool power and extend operating time. Some battery-powered tool manufactures are switching to Lithium-ion (Li-ion) batteries which allow making smaller and lighter portable tools due to the higher energy density of this new battery technology. Although the DeWALT charger I used for this article can charge both NiCad, NiMH, and the newer Li-ion battery technology, you still should standardize on one type to make sure all of your battery packs can use the same charger. For large solar power projects, I am a firm believer in using high-quality DC to AC inverters which allow using standard 120-volt AC appliances and power tools. Inverters are becoming much more reliable and less expensive, which allows using your existing house wiring instead of having to rewire everything for DC. However, powering 120-volt AC power tools requires a 1,500 to 3,000-watt inverter and very heavy battery bank. Some small inverters costing less than $50 are now available to power your laptop computers and video devices while in your car or truck. Unfortunately, many of these lower cost inverters do not generate the same waveform as the utility grid, which can cause problems with the more sensitive electronic devices you want to power. 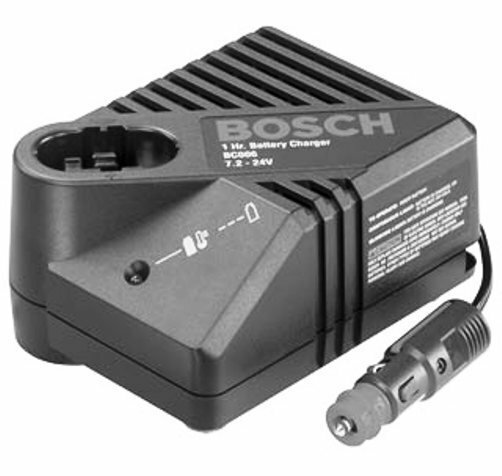 It is also true that many battery chargers for recharging power tools will have very poor charging performance when connected to a low-cost modified-wave 120-volt AC inverter. Most of these low-cost inverters also have a low power conversion efficiency, and can quickly drain your car or truck battery if the engine is off while powering any 120-volt AC device. I was pleasantly surprised, however, to find that most manufacturers of battery-powered construction tools now offer a version of their power tool battery chargers in a 12-volt DC portable model, typically called a “vehicle charger.” Although harder to find and a little pricey at $65 to $95, these DC-to-DC chargers provide the ability to recharge your 12 to 24-volt battery-powered tools from a 12-volt battery without inverter or generator. Here are some examples from Bosch and DeWalt. There are many advantages to using portable 12-volt power without the need for an AC inverter. Not only will this make all wiring easier and safer than dealing with 120 volts AC, but powering 12-volt DC devices directly from a 12-volt battery is much more efficient. This can be a real advantage if your construction project or weekend retreat is located in an area where hauling generator fuel and equipment up a mountain trail is a major effort. 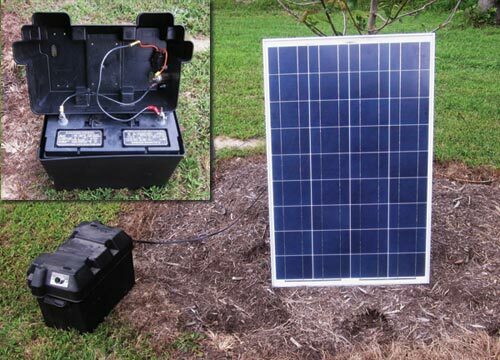 Although this project was intended primarily for powering tools at a remote job site, you can also use this portable solar-power system during a power outage or when camping to recharge your cell phone or power a laptop computer, since most of these devices include charging adapters to fit a 12-volt DC vehicle auxiliary outlet. I designed this project to require a minimum number of parts and very few wiring connections. I selected a standard Group 31 RV/Marine battery which is designed for multiple deep charge/discharge cycles while still being reasonably priced. I also found an inexpensive plastic battery box, 10 amp in-line DC fuse, and female cigarette lighter receptacle (Here's one with battery terminal attachments and fuse built in). I decided to use this type of power receptacle for this project since so many portable tools and electronic devices have charging adapters that fit this type of 12-volt DC receptacle. As shown in the photo, I mounted the cigarette lighter receptacle in the box cover and wired it through the fuse to the battery using #10 standard copper wire and crimp on ring terminals. The center post of the cigarette lighter receptacle is always connected the battery positive (+) and the outer shell is always connected to the battery negative (-). Also make sure the solar module is advertised for a nominal 12 volt charging voltage (17 volts peak), as manufacturers are increasing the physical size and wattage of their modules so fewer modules and wiring connections are needed for the same array total wattage. However, this increased module size also requires increasing the nominal voltage to 24 volts (35 volts peak) to keep current and wire size as small as possible, and this is too high for directly charging a 12-volt battery. While solar charge controllers are available to allow a mismatch between the solar array voltage and battery voltage so you could use a higher voltage solar module, these solar controllers tend to have a much higher cost and are too large to use in this very basic portable solar charging system. I purchased a Morningstar SunKeeper-12 charge controller, which is designed to mount into the standard ½-inch knockout opening in the solar module’s conduit box and is suitable for mounting out in the weather. You can locate the solar charge controller on the conduit box attached to the back of the solar module, if you can find one with a conduit, (or follow the MC4 instructions detailed above). Each tool charging cycle consumes an average of 7 amp-hours of battery capacity (7 amp charge rate for 1 hour). The Group 31 RV/Marine battery used for this project has 100 to 115 amp-hours of charge capacity, depending on price and brand. To avoid discharging this battery below 50% (which will help increase battery life), we will have approximately 50 amp-hours of useful charge capacity. This equals seven battery tool recharges (50 amp-hour/7 amp-hour) before the RV/Marine battery will need to be recharged. Of course, the actual number of tool recharges will depend on ambient temperature, battery age, and depth-of-discharge of the tool battery. We estimated this Group 31 solar battery will require 50 amp-hours of solar charging to replace what the battery tool charging took away. Assuming we have an average of five hours of full sun per day, this will require a solar module capable of providing 5 amps of output to fully recharge this size battery in two days. (50 amp-hours/5 amps = 10 hours). A typical 85-watt solar module designed to charge 12-volt batteries will typically have a peak output of 5.1 amps, so I selected an 85-watt module. 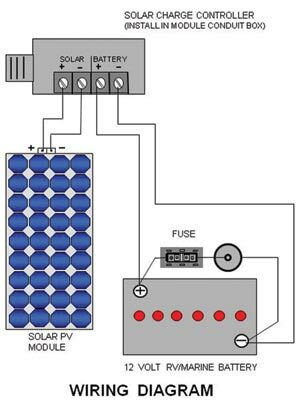 This smaller wattage module is also fairly easy for one person to carry, while still large enough to provide a reasonable amount of solar power. Your solar module can be larger or smaller than my 85-watt module selection, which will reduce or increase the number of days it takes to fully recharge the RV/Marine battery. I have also omitted solar and charging efficiency considerations to simplify our example calculation. I have also assumed a clear blue sky all day, no module shading, and proper module solar orientation. When these factors are taken into consideration, you will most likely only convert approximately 70% of any solar module’s nameplate output rating into useful battery charging. Do not be surprised if it actually takes a little longer to fully recharge the battery you select. It feels really rewarding to build something off-grid in a remote area with the convenience of labor-saving power tools without having to deal with a noisy generator. It’s also nice to have a portable solar-charging system instead of having to keep your truck running while using a DC to AC inverter to power your tools and tool chargers. 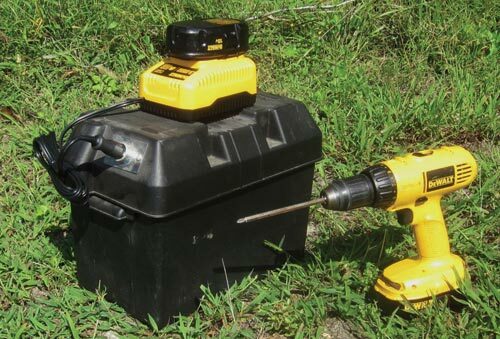 When not needed to recharge power tools at a job site, this portable solar-charging system can be used for camping or during emergency power outages. This solar module with built-in solar charge controller can even be used to recharge your RV camper batteries when dry camping. While most major manufacturers of battery-powered hand tools offer an “in-vehicle” charger, these are not easy to find in your local retail store. If you cannot find them locally, there are several Internet sites that sell in-vehicle chargers. Order the charger that matches your brand of battery-powered tools, and be sure the charger matches the voltage and chemistry of your battery packs. Milwaukee #M18 18-volt Lithium-ion wall and vehicle charger: This is one of the few that is also an A/C charger, so it's double-your-value. About the Author: Jeff Yago is a licensed professional engineer and certified energy manager with more than 30 years of experience in the energy conservation field. 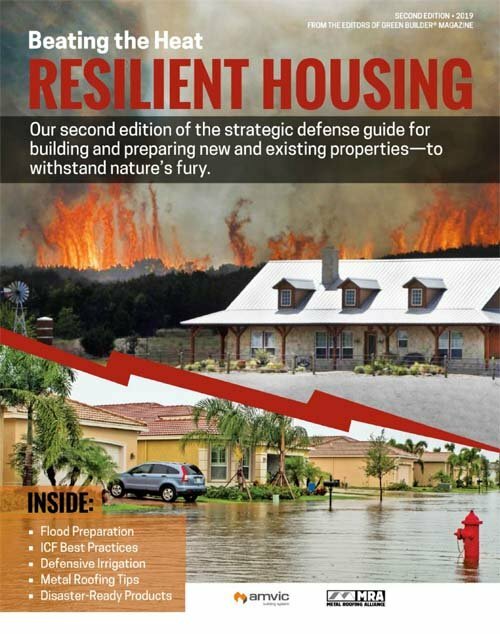 He has extensive solar and emergency preparedness experience, and has authored numerous articles and texts. His website is www.offgridprepper.com.